Today’s marketers are living in a dynamic world dominated by the desire to create meaningful customer interactions. And, in an industry hungry for the latest strategies—be it AI, live video, or chatbots—have we forgotten team fundamentals? Are we developing marketing teams capable of connecting with increasingly sophisticated consumers? Marketers today understand that a consistent customer experience is not a luxury to be provided to consumers but a necessity to stay competitive. However, marketers continue to be challenged with coordinated messaging as consumers move from channel to channel. Agile has arrived, and although many people think the agile method is all about speed, it is really about creating processes focused on collaboration, alignment, validated learning, iterative campaigns, and flexible planning. Agile, when done correctly, will eliminate communication silos, improve coordination, and elevate quality…basically helping teams ‘get it right’. You can cultivate an agile thinking team by focusing your attention on talent skills, data insights, and operations. Build your team to match your vision. Marketing visions can vary vastly from team to team. Building a team that functions as a single unit can be a significant challenge, especially in a growing company. Marketing teams need to maintain a healthy dynamic where ownership, ideas, and processes work together to achieve marketing and business goals. Assembling a team with a unified vision all starts with the recruiting process. To create a culture around agile thinking, you have to build a modern marketing team with agile skills…finding and nurturing T-shaped marketing talent — marketers who possess an extensive breadth of skills complemented by a significant depth of ability in a subset of those skills. According to Gartner’s 2017 Marketing Organizational Survey, 53% of modern marketers are already T-shaped — but the shift to dynamic work styles is causing an evolution of T-shaped marketer proportions. Traditional T-shaped marketers have broad but shallow experience across multiple areas together with a deep capability in one or two marketing capabilities. Today, however, a fat-T profile is taking hold. In contrast to traditional T-shaped marketers, fat-T marketers possess significant skills breadth and depth complemented by several areas of deeper, more specialized expertise. Fortunately, getting the right resources is easier today. As little as a decade ago, you could only learn so much about a new hire before bringing them onboard. Today, AI-driven tools like Harver automatically match applicant skillsets to job descriptions. You can even run a number of specialized tests for things like situational judgment, professional values, personality traits, and problem-solving capabilities. Put team talent development as your top priority. Investments here will pay significant dividends over time, fueling your agile core. Use data to think outside the box. Agile thinking inherently promotes flexibility, empowering teams to “think outside the box”. For a marketing team to break the norm and boost engagement, they must first understand exactly what “the norm” is. Agile’s iterative approach enables you to incorporate data and insights into your planning on an ongoing basis. One of the best ways to do this is by diving deep into the data you already have on your customers and competitors. You can mine this data for underlying insights in customer profiles, conversion patterns, etc. For example, an online retailer can use their point-of-sale data to target customers at every point of the customer journey, be it buy, own, or advocate. Using this data-backed information is the key to understanding pain points. You can’t find innovative solutions if you don’t understand the common snags in your systems, customer behavior, and shopping trends. Understand that agile thinking is not a linear process. Agile thinking is operationalized by formal (Kanban, Scrum, etc.) or hybrid methodologies that define several distinct actions. Although it may seem like these processes naturally flow from one stage to the next, there’s never a one-size-fits-all formula. Certain stages might need to be conducted simultaneously in order to view the situation from all angles or to reevaluate a plan or to pivot and adjust direction. It’s better to view the process as a loop to continuously facilitate collaboration, ideation, development, execution, and measurement. 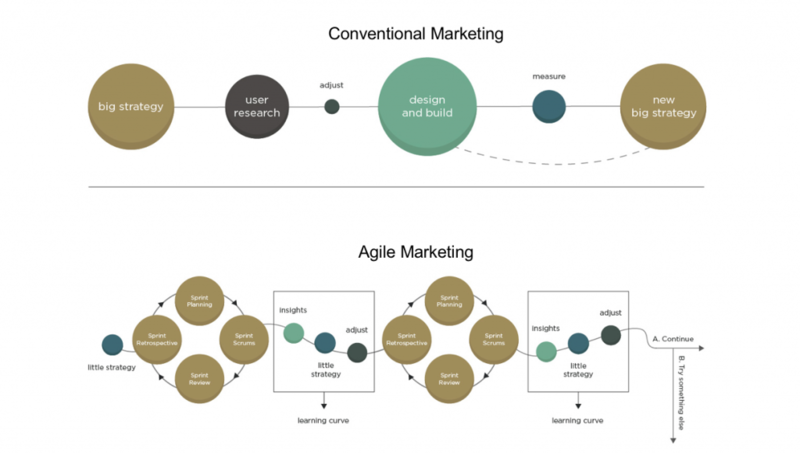 For a marketing team to thrive under agile thinking, they must come to terms with the fact that they will need to define an agile methodology that best supports their team — balancing corporate culture, staffing skills, and technology.